One Man’s Trash…Leadership is Art! I am writing this post while in Calgary, Alberta, Canada for a conference. I am always amazed at how the littlest of events will inspire posts for my blog. Allow me to tell a story of another one of those times. With a little free time I was doing what I do best – explore and be curious. 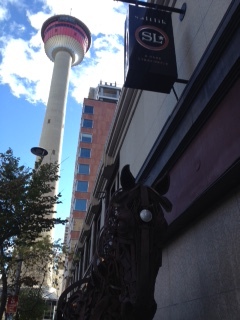 As I was exploring the streets of Calgary I came across an interesting sculpture of a horse outside Saltlik A Rare Steakhouse (I am eating there tonight). I have posted a few pictures of it in this post. It is actually a major work of art in my opinion. 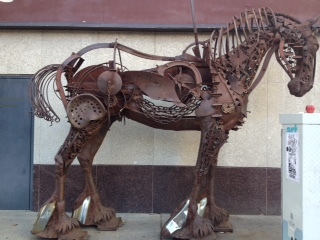 Basically, the artist took metal pieces of farm equipment and tools and welded them into this great representation of a horse. Really, it is amazing enough that I probably looked at it and analyzed for about an hour. Now, as a farm boy, let me tell you it is awesome! When I first viewed it, in awe, I first thought of the old phrase, “One man’s trash is another man’s treasure,” because all of these tools and parts would really be of no value to anyone today, from an agricultural industry point of view. Yet, these worthless pieces of metal were looked at by the keen eye of an artist who saw value and placed the pieces together in perfect harmony to form this magnificent representation of a draft horse. The longer I gazed at the beast and identified the parts of metal (my dad would have been proud) two other thoughts came to mind. Some leaders, and I consider myself one of these, are artists. We take what we have, what we can find, and what we can develop – whether time, treasures, talent in the form of people, or other resources, and mold those into something amazing. Some call this visionary, but I prefer artist. A visionary is not necessarily an artist. A visionary person can see direction and predict what needs to be done, but can’t always see how to put it all together. Take a close look at the horse and imagine all those pieces lying on the ground. A visionary might say, “let’s make something,” but the artist starts taking the pieces and welding them together while seeing the horse the whole time in her mind. The artist says, let’s make a horse,” and then proceeds to do it. I strive everyday to hone my skills as an artistic leader providing wowful educational leadership. Another thought I had while looking at the iron equine was all the different pieces that were welded together are like all of the different individuals that make up our teams or organizations. 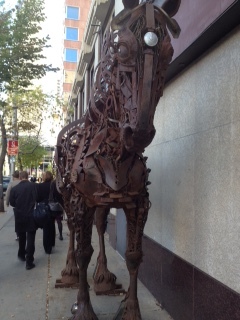 Every piece of metal that makes up this horse had a specific role to play. If you look closely there is a tractor seat, part of a sickle, plow shear, cultivator points, leaf springs, and the list goes on and on. Again, every piece had a role. Sound familiar? This imagery hit me so hard and reminded me how important it is to make sure that every person in your business, organization, or school understands his or her specific role in carrying out the vision, mission, and action plan of the organization. This then empowers your team members to work effectively on high achievement of the key performance indicators (KPI) for your organization. Next time you are working with your team, take a little time to imagine them all as pieces that come together to build the artwork of a successful organization! If you do that you are not just horsing around!! !